Brazilian Jiu Jitsu Clubs and blog located in Auckland / Sandringham and Epsom / New Zealand contact us on info@aucklandbjj.com. Run by IBJJF Black belts (1 degree) Stuart Mitchell and Serge Morel. Our classes are on Mondays and Wednesday from 6-8 pm at 681 Sandringham Road (Sandringham) and Tuesdays and Thursdays from 6-8 pm at 6 Woodhall Road (Epsom) Auckland, New Zealand. I try to not copy other people's articles. However I made an exception on this one because it is near impossible finding out interview of the master translated in English. Tonicao means big Toni (just in case you wondered). Tonicao gave the black belt to Douglas Santos. Therefore Tonicao is part of our lineage. I translated from Portuguese to English and made some corrections. 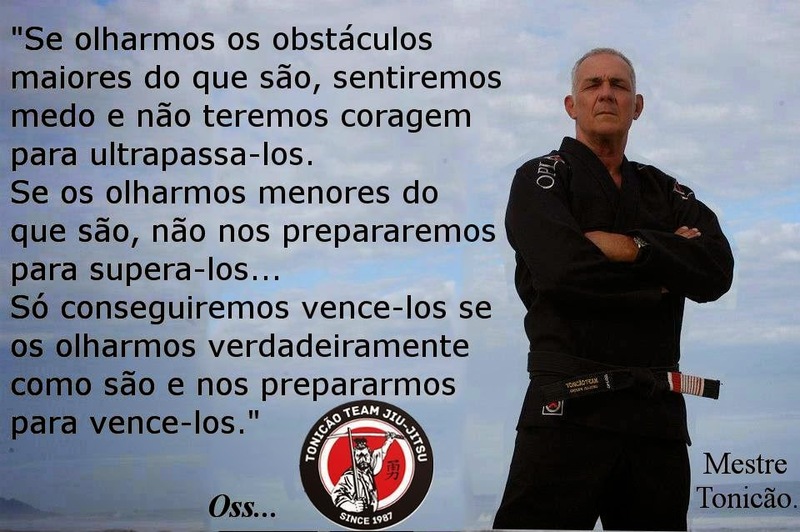 The first developer of Jiu-Jitsu in Santa Catarina, this black belt (almost red and black) of 54 years well lived, 30 of them devoted to the Jiu-Jitsu, is definitely a person with a lot of histories . An extremely "good people", that captivates people in 10 minutes of conversation, no exception to the questions and plays with death. Enjoy the result of this pleasant conversation with the "Master Tonicão" which lasted an entire afternoon, against the backdrop of the sweeping views of Lake of Conception. I had already done Judô with Mehdi and was doing Karate with Watanabe. I met the guys of the Jiu-Jitsu through a friend called Nile, which train with the Rolls. He introduced me to Rolls, the Jiu-Jitsu and I was curious to know. I arrived back in the gym of Rolls to train and thought it was an interesting fight. Then I started to train and was there I began to play. And how was your route to reach the Black Belt? I started with the Rolls. I am very proud to have trained with him because he was a great guy. He was a light weight that train with everyone, this was not a choice. Once the Rolls died, was the Carlinhos (Gracie). I learned some time with Carlinhos, until the purple belt, and then I went out and I was training with Rickson until black belt. And who were the great champions of that era? At the time of the Rolls had Márcio Macarrão, the Jacaré Romero, the Malibú, the father of Roger Maurição. And who were your major opponents? They were mainly students from Carlson, because at that time had one fight between students of the Rolls and Carlson. The guys were almost killed. It was very funny. The championships were virtually internal Gracie between the academies. And who was the better fighter of Jiu-Jitsu of all time? Of the ones I saw fight, 2 guys were the best for me: The Rolls Royce and Rickson. It had many good, it was Marcelo Behring .... but the guys that I called for more attention, the technique, the simplicity and humility, were Rolls Royce and Rickson. How you got to teach class? The Rickson was giving private classes. There were few entrepreneurs who trained with him every day at 7:00 in the morning. Then one day he had called me along with Marcelo Behring to help him. Then we went there and in the beginning was only looking and learning. One day he asked me to get to teach class and he was only observing. As I had seen how he was doing, all the details, I learned and did the same. The next day was the Marcelo Behring, who did everything right, too. I remember they had some pictures on the wall, with photos and drawings, teaching lessons of the program. It was only following what there. First flight of hip class, second class ex-mounted, and so on. One day Rickson told the entrepreneurs that we would start giving them these lessons. They agreed and it was all right. Uncle Helio (Gracie) did not want us to teach those classes, but the Rickson convinced him, and everything was right. But at least had salary? Salary not (laughs) but for us it was an honour to be called by Rickson to class. And he sometimes would give us a kimono. There was also Carlos (Gracie), who took care of feeding the family and when they went shopping in Ceasa, when we took together. That gave watermelon, papaya, box. But for us the payment was the biggest honour to be living with them and giving lessons. And with that experience you decided to come live in Santa Catarina? ( I came to the South since 1970 to surf. I thought so beautiful here. Every year I was 2 times in the winter and summer. Until I came in 1986 and was 2 months. When I returned to Rio, I was talking with Rickson that I wanted to come live here and expand the Jiu-Jitsu. He encouraged me and I came. I stayed 1 and a half years in Garopaba. I had a good life there, but the Jiu-Jitsu was growing very slowly. Then came to Floripa and started giving classes on the campus of UFSC (University). Gradually the sport increased , started a gym in my house in Lagoa da Conceicao, I invite all friends, the staff was coming, there came the MurilãoRupp), the Ricardão (De Luca), then Marcelo (De Luca), and grew until today. And ho did Double Attack (Ataque Duplo) began? The double attack was created by my first two black belts, Serginho and Murilo de Sá Rupp. They came together and formed the double attack, which grew until now, thank God, for this great family that it is today. How does the structure and administration of the team? Who manages everything is Murilo. He talks with me always, we are always in contact, but those who manage it all is. I agree with everything he does. Murilo is a son I have. I have the greatest pride of it. He was my best black belt, and still very good today. An excellent athlete, a wonderful character. I am very proud of all my students. We are a family. People say that Thiaguinho (Tavares) is my grandson, "because it is" son "of Murilo. Recently you get dressed the kimono fight the South American. How was this emotion to come back to fight, win and be applauded by all standing gym, then the problem of health that you had? It was a very strong emotion. Life is a challenge, and people like these things fighter has to overcome the challenges. I had a very serious pancreatitis, which is an inflammation of the pancreas. I was operated several times, had to take the gallbladder and I was 8 months in the hospital in that died-not-die, that confusion. I lost 30 kg and was looking a skull. My friends come visit me and when I opened the door they took a fright. Some cried, others get disguise and said I "was well." But Thank God that warrior mentality of the Jiu-Jitsu saved me, helping me to get out of that. I was imagining that the hospital had a huge guy wanting me get anyway (tapping me out), in that case was the disease. But I had the patience to wait for the right time, given that "hips move" and escape (laughter). 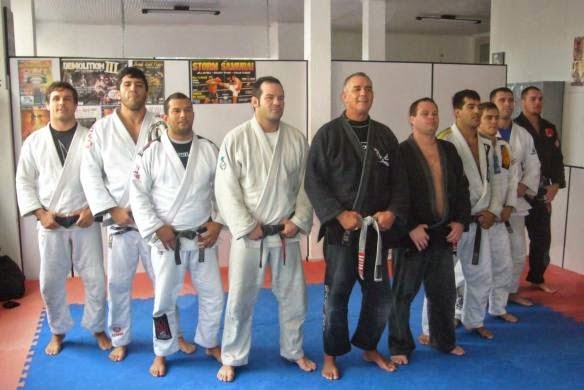 You as the first developer of the sport in Florianopolis, went through all phases of Jiu-Jitsu here. How do you see the growth of our sport in our city? I am very proud to have contributed to what the Jiu Jitsu is today. The well that the Jiu-Jitsu is doing to people. I see many people living from Jiu-Jitsu, several family fathers living their life from Jiu-Jitsu, something that was difficult to imagine before. And do you think you will remembered here in Floripa in about 50 years? I think with affection. I have great respect and affection with people I meet. And we get that in return. I hope to remember me that way. I am humble, so for me is always good, everything is great (laughter). This is my way of living. No. But I am Murilo, Mexican, Thiaguinho, all this troop of Double Attack academy are my children. Then send a message to them. I love you, I think I don't need to say this, I say it all day. I train with them every day. I put the kimono and I fight, that's my life. To conclude, where does Tonicão gives lessons today? I give classes in Academia Forma, in Lagoa da Conceicao. Mon, Wed and Fri I pull the training, and Tue and Thu I'm going to train with the guys. Sometimes I go to the Centre, to Mexican's academy, and Racer at Trinidad, where Lobinho gives lesson. The biggest Mind Trick of BJJ: "Creonte"
What is this tab on your Jiu Jitsu belt?